Flooding due to unusually high rainfall has dominated UK news in recent months. But, of course, there have been countless other flooding events throughout history. 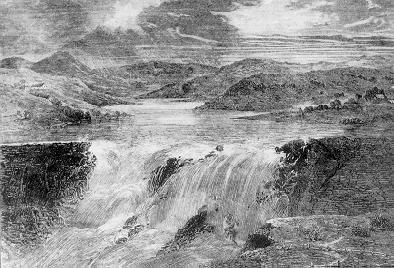 This week, memorial services, guided walks and exhibitions are being held to mark the 150th anniversary of one in particular – the Great Sheffield Flood of 1864, which claimed 240 lives. The Dale Dyke Reservoir today, having been rebuilt in 1875. Sheffield, now one of the UK’s largest cities, experienced rapid industrialization in the 1800s. It had developed as a centre for blade and then cutlery production, due to the favourable combination of fast flowing rivers, surrounding hills and the availability of the raw materials coal, iron ore and millstone grit (coarse grained sandstone of Carboniferous (Namurian) age). 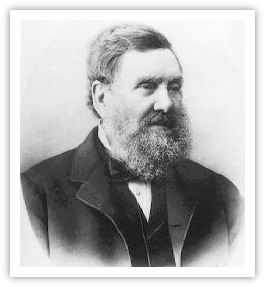 As the cutlery industry grew, the need for reliable mass-produced steel increased and pioneers such as Benjamin Huntsman, who invented an early crucible process for steel making at his workshop in Sheffield, and Henry Bessemer, whose ‘Bessemer converter’ triggered the building of the first steelworks in the town, led the way. 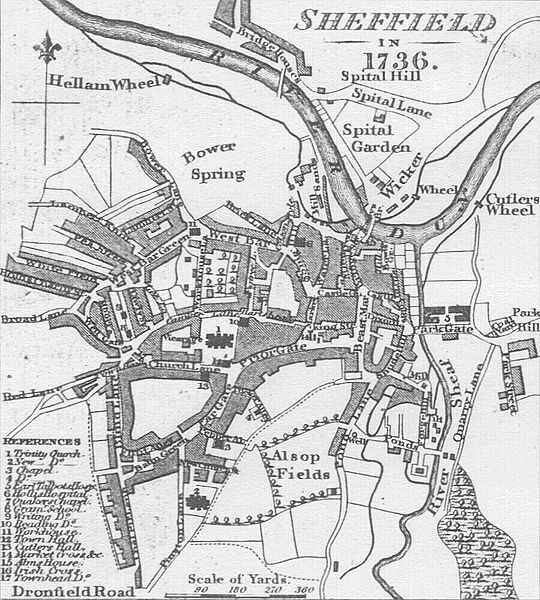 Sheffield in the eighteenth century. This was Sheffield’s boom-time, and the population soared from 45 500 people in 1801 to 185 000 inhabitants in 1861. This rapid expansion made enormous demands on water supply. 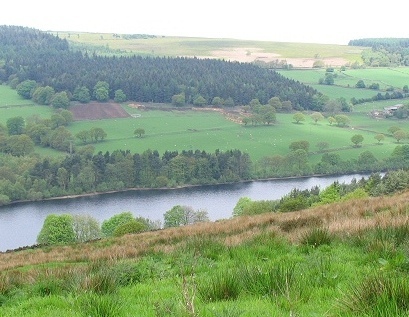 To address this, the Sheffield Waterworks Company (SWWC) purchased land in the Loxley Valley, about 8 miles north west of the city. 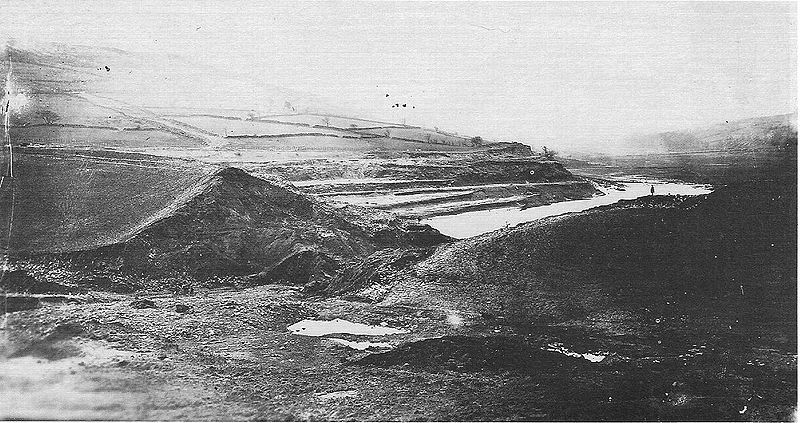 The new initiative was called the ‘Bradfield Scheme’, and comprised 4 large reservoirs to be constructed in the hills around Bradfield. The first, of ambitious size for the time, was the Dale Dyke Dam, and work began in 1859. By late February 1864, the dam was all but finished; it was almost full of water and work on the second of the reservoirs was underway. On the evening of Friday 11 March, a workman, unconnected with the project, was crossing the embankment on his way home. The weather was stormy, with strong winds sending spray over the dam wall. He noticed a crack along the embankment, which if not of worrying width, was certainly very long. Not wanting to keep this observation to himself, he reported the crack, and eventually the chief engineer for the Waterworks company, John Gunson, was sent for. He summoned another contractor, and by 10pm the two men, travelling in a gig in the abysmal weather, reached Dale Dyke Dam and began their inspection. They decided that the crack was in all likelihood superficial, and due to either frost damage or settlement; but that as a precaution, until a full investigation could be undertaken, the water level should be lowered. As the drain holes had already been opened, but would take some time to have an effect, gunpowder was called for to blow additional, faster-acting drainage channels. But it was too little, too late. Artist’s impression of the bursting of the Dale Dyke Dam. Gunson made a final check on the crack, but realized that water was running ‘like a white sheet’ under his feet and into the crack. As he made his way further down the embankment a colleague called to him to get out of the way. The ground under his feet started to vibrate violently, and as he escaped to the side of the embankment a large section of the dam wall collapsed. At almost exactly midnight, 650 million gallons of water poured down the Loxley and then Don valleys, thundering into the centre of Sheffield. Dale Dyke Dam after the flood. The scene of desolation the next day was something to behold. Many people had died in their sleep; others had drowned as they attempted to escape from buildings. The Sheffield workhouse was flooded to a depth of 4 feet, but remarkably, those in the hospital wards on the ground floor were rescued and no inmates died. But the workhouse, and a series of public houses, came to be temporary morgues. Bodies were still being brought to the workhouse a week after the flood. In all, an estimated 240 people died and some 700 animals were drowned. The floods either partially or completely destroyed 415 houses and 20 bridges. Some victims were found a surprising distance from the reservoir – 13 at Rotherham and several more at Doncaster, around 27 miles away. Modern day structures that would have been affected include the Don Valley Stadium, Sheffield Arena and Meadowhall shopping centre. What caused the dam collapse? Article from the Illustrated London News. The flood was national news, and a relief fund was set up to which Queen Victoria herself contributed. Within days of the catastrophe, two government inspectors, Robert Rawlinson and Nathanail Beardmore, were dispatched to Sheffield to investigate. Both men were Fellows of this Society. The report they presented to Parliament identified both bad design and bad workmanship, but was essentially inconclusive. A suspected fracture to an outlet pipe was highlighted as a possible cause of instability, but of course after the collapse this was impossible to confirm. John Gunson and the consulting engineer from the SWWC strongly denied all claims of incompetence, and argued that in their opinion, the cause was new movement in an area that had previously suffered from landslip. They both avoided prosecution. As that year progressed, a succession of leading civil engineers was employed to make assessments of what had happened. 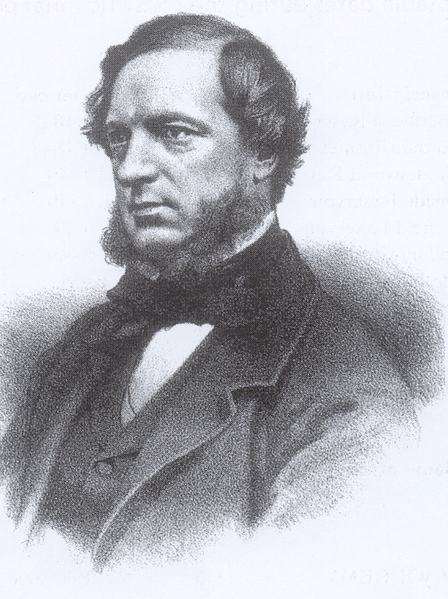 Two of these were again Fellows of the Geological Society – John Frederick Bateman and John Fowler. However, opinions still differed, and the debate continued into the next century. The Dale Dyke Dam was rebuilt in 1875, on a smaller scale and 300m upstream. 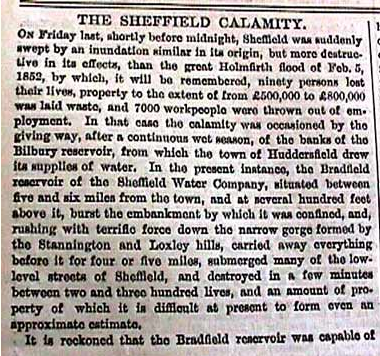 The 1864 flood remains one of the worst disasters the country has seen, but is strangely forgotton now, particularly outside of Sheffield. The 150th anniversary is an opportunity to remember those who died, as well as the vital importance of engineering to our lives. Tags: engineering, flooding, hazards, history, Sheffield, water. Bookmark the permalink.